Mark your calendars for the annual Madison Fashion Affair. 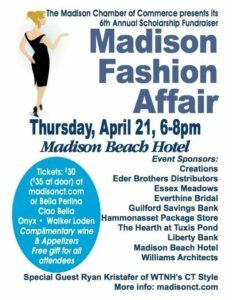 Come see what’s in style for spring and summer at the gorgeous Madison Beach Hotel on Thursday night April 21st. Ticket sales contribute to our the College Scholarship fund for hardworking local students. Special guest appearance by Ryan Kristafer from WTNH CT Style. Enjoy complimentary wine and appetizers while at the show. Stay at the Scranton Seahorse Inn the night of the show for just $140 which include an overnight stay, 2 tickets to the show and of course a full breakfast in the morning. Call us at 203.245.0550 to reserve your seat at the show and your favorite guest room.